Company data that shows the complex relationships between companies and their subsidiaries worldwide is being made available as part of an initiative to place more government data in the public domain. 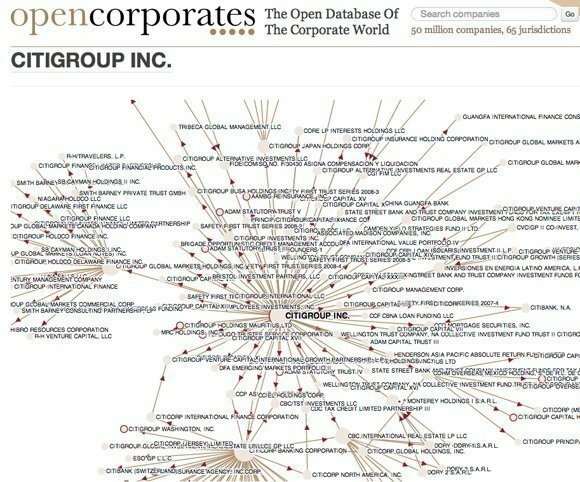 OpenCorporates, part of the Open Data Institute established by web inventor Tim Berners-Lee, is publishing data on millions of international companies and their subsidiaries – the first time the data has been made freely available. The move is one of the first concrete actions to follow the G8 summit, where member states signed an Open Data Charter, committing them to make data available in ways that are easily discoverable, usable or understandable by the public. 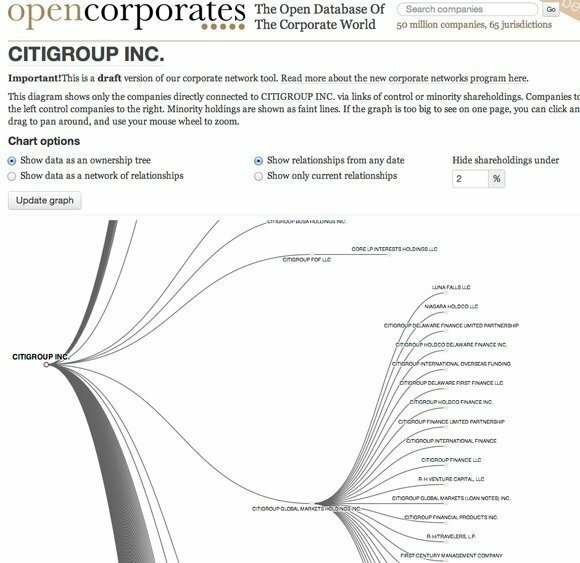 The OpenCorporates website uses sophisticated analytics technology to map the relationships between companies registered in different jurisdictions, revealing complex networks of ownership. It is able to present the results graphically in the form of maps or network diagrams, showing the relationships between companies in a way that is easy to understand. “The site is an important resource for journalists, shareholders and for credit checking. It is also important for procurement officers and lawyers who need to understand conflicts of interests,” said Chris Taggart, chief executive of OpenCorporates. The company’s analysis of the worldwide interests of the largest US banks, including Bank of America, Citigroup, Goldman Sachs and Morgan Stanley, reveals complex networks of ownership, running in some cases 14 companies deep. It shows the central role of the offshore tax haven, the Cayman Islands, as an international hub for the banking industry’s company networks. “It is the central gateway through which links seem to pass. That is significant to insurers and regulators which are concerned about risk,” said Taggart. 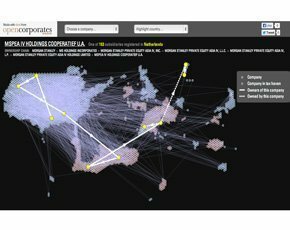 Other analyses show the worldwide interests of IBM, Starbucks and Barclays, revealing a labyrinthine network of related companies that span the globe. OpenCorporates is drawing data from the US Securities and Exchange Commission, the National Information Centre of the Federal Reserve System in the US, and the New Zealand corporate registry. However, Taggart has not yet been able to incorporate data from the UK’s Companies House, partly because of the fees charged by Companies House and partly because information on UK shareholders is not easily available in a digital form. OpenCorporates plans to add other data sources, over time, and to add crowd sourcing capabilities to the site, which will make it possible for individuals or institutions to fill in details about company relationships which usually lie buried in the small print of annual reports. As more company data becomes available, Taggart believes there will be increasing pressure on businesses to be more transparent about their company structures. “The more transparent, more proactive companies will start to say, rather than have the crowd do this, 'We have nothing to hide, we will just publish our corporate network',” he said. OpenCorporates, which has received an initial grant from Alfred P Sloan, one of the funders of Wikipedia, takes its business model from the open source software movement. It will make company data available free of charge, but businesses that want to make use of the data for private commercial purposes will need buy a licence. “The information is there for people to use – you don’t have to open your chequebook and pay a huge amount of money to play with the data,” said Taggart. Exposing company data to the public will improve the quality of the data collected by regulatory bodies, he said. People using OpenCorporates have already found errors in the company data collected by the US Federal Reserve, for example. “We would love to see the UK regulators, the Bank of England and other regulators using this platform to share data,” said Taggart. OpenCorporates is one of a number of companies based at London’s Open Data Institute (ODI), founded by Tim Berners-Lee and professor of artificial intelligence Nigel Shadbolt. “Companies which believe in ethical trading and honest markets have nothing to fear and much to gain from open data. Understanding their networks will enable governments, businesses and citizens to make better decisions,” said Shadbolt. The UK government has been an advocate for open data, giving £10m funding last year to create the ODI.